This UK page has been accessed times. Psycoloquy is a refereed international, interdisciplinary electronic journal sponsored by the American Psychological Association (APA). Psycoloquy publishes target articles and peer commentary in all areas of psychology as well as cognitive science, neuroscience, behavioral biology, artificial intelligence, robotics/vision, linguistics and philosophy. See Instructions and Background and Preliminary Citation Information. Psycoloquy Home Archive at Princeton University (via ftp) . Psycoloquy Home Archive at Princeton University (via gopher -- often more reliable) . Psycoloquy / University of Virginia (brief fall from Grace, now again reliable...). Alternatively, you can receive Psycoloquy automatically by email subscription or even as a Usenet Netnews group instead of by direct browsing of the archives. Andrew Odlyzko (mathematics) : Tragic Loss or Good Riddance? Psycoloquy (ISSN 1055-0143) is sponsored on an experimental basis by the American Psychological Association. It is currently estimated to reach a combined Listserv and Usenet subscribership and readership of 40,000 (ftp, archie, gopher, wais and www "hits" are not yet quantified). 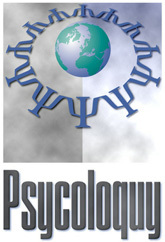 Psycoloquy publishes brief reports of new ideas and findings on which the author wishes to solicit rapid peer feedback, international and interdisciplinary ( "Scholarly Skywriting" ), in all areas of psychology and its related fields (biobehavioral science, cognitive science, neuroscience, social science, etc.). All contributions are refereed. the authors' full name(s) and institutional address(es). a list of potential commentators (with their email addresses). All paragraphs should be numbered in articles, commentaries and responses (see format of already published articles in the Psycoloquy archive; line length should be < 80 characters, no hyphenation). It is strongly recommended that all figures be designed so as to be screen-readable ascii. If this is not possible, the provisional solution is the less desirable hybrid one of submitting them as postscript files (or in some other universally available format) to be printed out locally by readers to supplement the screen-readable text of the article. Psycoloquy also publishes multiple reviews of books in any of the above fields; these should normally be the same length as commentaries, but longer reviews will be considered as well. Book authors should submit a 500-line self-contained Precis of their book, in the format of a target article; if accepted, this will be published in Psycoloquy together with a formal Call for Reviews (of the book, not the Precis). The author's publisher must agree in advance to furnish review copies to the reviewers selected. (substituting your First and Last name, of course). These instructions do work, so please follow them faithfully! If for some reason you still do not succeed, send email to psyc@pucc.bitnet or pscy@pucc.princeton.edu and we will subscribe you by hand. Psycoloquy can also be accessed on Usenet as the moderated newsgroup sci.psychology.journals.psycoloquy , but then you will regularly have to check Usenet for new issues, because they are not automatically emailed to you as they are in the Bitnet version (the Listserv access model is individual subscription, the Usenet access model is an institutional library). The Usenet edition is sent to your institution's Usenet archive, and kept there for a few weeks. After that, it must be retrieved from the permanent Psycoloquy archives by ftp, archie, gopher, or www. The following is a list of articles and materials concerning electronic publication, almost all of which are retrievable. Harnad, S. (1990) Scholarly Skywriting and the Prepublication Continuum of Scientific Inquiry. Psychological Science 1: 342 - 343 (reprinted in Current Contents 45: 9-13, November 11 1991). Harnad, S. (1991) Post-Gutenberg Galaxy: The Fourth Revolution in the Means of Production of Knowledge. Public-Access Computer Systems Review 2 (1): 39 - 53 (also reprinted in PACS Annual Review Volume 2 1992 ; and in R. D. Mason (ed.) Computer Conferencing: The Last Word. Beach Holme Publishers, 1992; and in A. L. Okerson (ed.) Directory of Electronic Journals, Newsletters, and Academic Discussion Lists, 2nd edition. Washington, DC, Association of Research Libraries, Office of Scientific & Academic Publishing, 1992). Harnad, S. (1992) Interactive Publication: Extending the American Physical Society's Discipline-Specific Model for Electronic Publishing. Serials Review, Special Issue on Economics Models for Electronic Publishing, pp. 58 - 61. Harnad, S. (1995) Implementing Peer Review on the Net: Scientific Quality Control in Scholarly Electronic Journals. In: Peek, R. & Newby, G. (Eds.) Electronic Publishing Confronts Academia: The Agenda for the Year 2000. Cambridge MA: MIT Press. ABSTRACT: Electronic networks have made it possible for scholarly periodical publishing to shift from a trade model, in which the author sells his words through the mediation of the expensive and inefficient technology of paper, to a collaborative model, in which the much lower real costs and much broader reach of purely electronic publication are subsidized in advance, by universities, libraries, research publication grants, and the scholarly societies in each specialty. To take advantage of this, paper publishing's traditional quality control mechanism, peer review, will have to be implemented on the Net, thereby recreating the hierarchies of journals that allow authors, readers, and promotion committees to calibrate their judgments rationally -- or as rationally as traditional peer review ever allowed them to do it. The Net also offers the possibility of implementing peer review more efficiently and equitably, and of supplementing it with what is the Net's real revolutionary dimension: interactive publication in the form of open peer commentary on published and ongoing work. Most of this "scholarly skywriting" likewise needs to be constrained by peer review, but there is room on the Net for unrefereed discussion too, both in high-level peer discussion forums to which only qualified specialists in a given field have read/write access, and in the general electronic vanity press. Hayes, P., Harnad, S., Perlis, D. & Block, N. (1992) Virtual Symposium on the Virtual Mind. Minds and Machines 2(3) 217-238. ABSTRACT: When certain formal symbol systems ( e.g. , computer programs) are implemented as dynamic physical symbol systems ( e.g. , when they are run on a computer) their activity can be interpreted at higher levels ( e.g. , binary code can be interpreted as LISP, LISP code can be interpreted as English, and English can be interpreted as a meaningful conversation). These higher levels of interpretability are called "virtual" systems. If such a virtual system is interpretable as if it had a mind, is such a "virtual mind" real? This is the question addressed in this "virtual" symposium, originally conducted electronically among four cognitive scientists: Donald Perlis, a computer scientist, argues that according to the computationalist thesis, virtual minds are real and hence John Searle 's Chinese Room Argument fails, because if Searle memorized and executed a program that could pass the Turing Test in Chinese he would have a second, virtual, Chinese-understanding mind of which he was unaware (as in multiple personality). Stevan Harnad , a psychologist, argues that Searle's Argument is valid, virtual minds are just hermeneutic overinterpretations, and symbols must be grounded in the real world of objects, not just the virtual world of interpretations. Computer scientist Patrick Hayes argues that Searle's Argument fails, but because Searle does not really implement the program: A real implementation must not be homuncular but mindless and mechanical, like a computer. Only then can it give rise to a mind at the virtual level. Philosopher Ned Block suggests that there is no reason a mindful implementation would not be a real one. ABSTRACT: We have heard many sanguine predictions about the demise of paper publishing, but life is short and the inevitable day still seems a long way off. This is a subversive proposal that could radically hasten that day. It is applicable only to esoteric (non-trade, no-market) scientific and scholarly publication (but that is the lion's share of the academic corpus anyway), namely, that body of work for which the author does not and never has expected to sell his words. He wants only to publish them, that is, to reach the eyes and minds of his peers, his fellow esoteric scientists and scholars the world over, so that they can build on one another's contributions in that cumulative, collaborative enterprise called learned inquiry. For centuries, it was only out of reluctant necessity that authors of esoteric publications entered into the Faustian bargain of allowing a price-tag to be erected as a barrier between their work and its (tiny) intended readership, for that was the only way they could make their work public at all during the age when paper publication (and its substantial real expenses) was their only option. But today there is another way, and that is public ftp : If every esoteric author in the world this very day established a globally accessible local ftp archive for every piece of esoteric writing he did from this day forward, the long-heralded transition from paper publication to purely electronic publication (of esoteric research) would follow suit almost immediately. This is already beginning to happen in the physics community, thanks to Paul Ginsparg's HEP preprint archive , with 20,000 users worldwide and 35,000 "hits" per day, and Paul Southworth's CICnet is ready to help follow suit in other disciplines. The only two factors standing in the way of this outcome at this moment are (1) quality control ( i.e. , peer review and editing), which today happens to be implemented almost exclusively by paper publishers, and (2) the patina of paper publishing, which results from this monopoly on quality control. If all scholars' preprints were universally available to all scholars by anonymous ftp (and gopher, and World Wide Web, and the search/retrieval wonders of the future), no scholar would ever consent to withdraw any preprint of his from the public eye after the refereed version was accepted for paper " public ation." Instead, everyone would, quite naturally, substitute the refereed, published reprint for the unrefereed preprint. Paper publishers will then either restructure themselves (with the cooperation of the scholarly community) so as to arrange for the much-reduced electronic-only page costs (which I estimate to be less than 25% of paper-page costs, contrary to the 75% figure that appears in most current publishers' estimates) to be paid out of advance subsidies (from authors' page charges, learned society dues, university publication budgets and/or governmental publication subsidies) or they will have to watch as the peer community spawns a brand new generation of electronic-only publishers who will. The subversion will be complete, because the (esoteric -- no-market) peer-reviewed literature will have taken to the airwaves, where it always belonged, and those airwaves will be free (to the benefit of us all) because their true minimal expenses will be covered the optimal way for the unimpeded flow of esoteric knowledge to all: In advance. See the book edited by Okerson & O'Donnell for a hard copy of the full discussion.